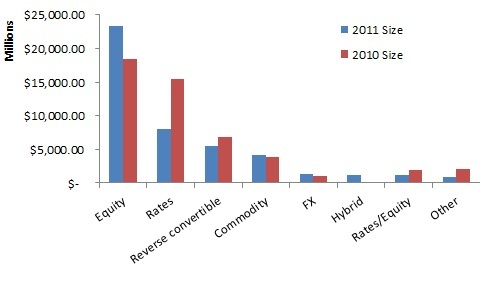 2011 was another big year for structured product sales both in the US and abroad. According to Bloomberg’s year end totals, almost $45.5 billion worth of SEC registered structured products were sold in the US in 2011, down only slightly from $49.4 billion in 2010. There were 7,293 individual products sold, up from 6,443 a year earlier. The number of products linked to interest rates decreased, which was made up for with increases in products linked to equity assets. Sales in Europe grew substantially, with a total volume of $101.8 billion, over $82.6 billion in 2010. Interestingly, the number of deals fell slightly from 4,742 to 4,406: it seems that structured products are on average smaller in the US and that the difference is growing. Also interesting is that several product features have become more popular over time. 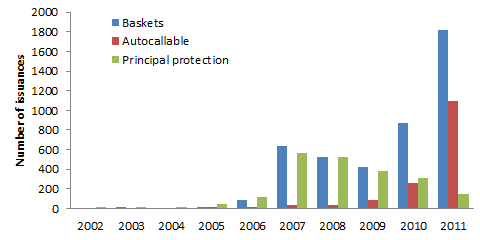 It seems that in the US, autocallable products have become much more popular in recent years, whereas principal protection notes have fallen off, and those tied to baskets of underlying securities have waxed and waned but taken off recently. Structured products are an active area of research at SLCG, and we now have a variety of research papers on important structured product issues. We also have a database of structured product valuations, available for free at http://slcg.com/products.php. We will continue to closely monitor the structured product market, as it is one of the most innovative financial markets today.